ABATE of Wisconsin Annual Lobby Day | Hupy and Abraham, S.C.
March 13, 2014, marked the day ABATE of Wisconsin members from across the state descended on the capitol. 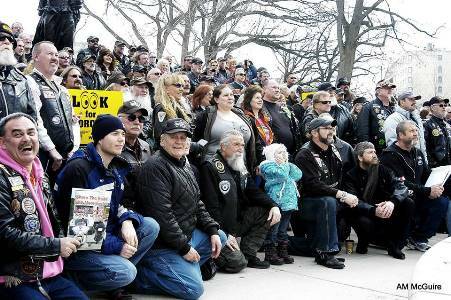 With no "red flag" issues on the agenda, attendance was lower than past years but still nearly 500 leather clad riders walked the hallowed halls beneath the Golden Lady "Wisconsin" perched on the dome, 284 feet above the ground. 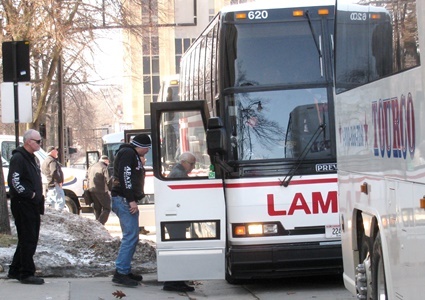 As in the past, chartered buses carried riders to Madison and Hupy and Abraham, S.C. provided the bus from south east Wisconsin as a service to ABATE, something the law firm has done for the last five years. In all, a total of nine buses transported ABATE members and friends from every corner of the state to engage in the art of discussing the legislative agenda and concerns of the organization with the state's lawmakers. One of the top issues for 2014 was the comparison of the monies generated by motorcycle registration fees ($2.45 million), needed to help fund the Motorcycle Safety Program, and the actual expenditure of those monies (about $1.3 million). ABATE believes there are appropriate uses for the unused portion of the funds that will have a positive effect on motorcycle safety in Wisconsin. One example of a low cost option is to continue to use the DOT permanent highway information billboards to remind motorists to Watch for Motorcycles. This message was utilized during the recent Harley-Davidson 110th Anniversary with great success. Another hot topic was the issue of unendorsed riders. SB270 offers a solution by allowing these riders to take a Motorcycle Safety Foundation experienced rider course instead of a beginner riders course in order to obtain a waiver and be endorsed. 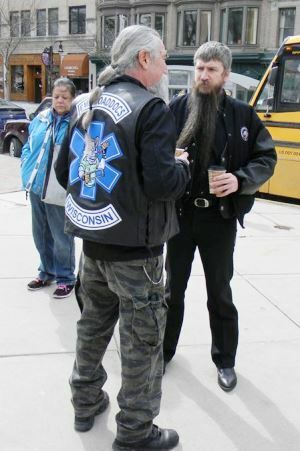 Over 40% of the fatalities recorded in Wisconsin in 2012 involved unendorsed riders. Hopefully we can get these riders, many of whom have been riding for years without the M endorsement, into an experienced riders class to brush up on their skills and show they are proficient enough to be endorsed. ABATE has a staff of volunteers that worked tirelessly to coordinate appointments for meetings in conference rooms and also individual office visits, ensuring that every representative met with or was contacted by ABATE on March 13th. Actually, the legislators look forward to the annual visits and many have expressed gratitude that ABATE does such a professional job as a grassroots rights organization. Each of the many conference room meetings were attended by multiple legislators and/or staff as well as constituents from the ranks of ABATE. Those legislators unable to attend a scheduled meeting were contacted later in the day and talking points folders were left with legislative assistants that highlighted the issues that ABATE brought to the Capitol that day. Besides the issues concerning Wisconsin only, ABATE alerted the legislators of issues pending on a federal level. Those issues included the E-15 fuel question about the possible damage to air-cooled engines and the need for further study. Also, the motorcycle only checkpoints controversy and the bi-partisan bill (HR 1861) which would prohibit the federal DOT from issuing grants to continue the use of these checkpoints. 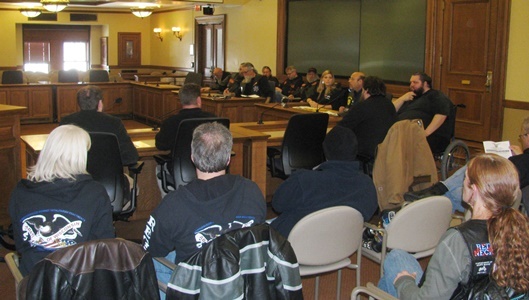 ABATE of Wisconsin reminded legislators of its goal to keep all motorcyclists safe on Wisconsin roadways by preventing crashes through awareness and training. ABATE looks forward to continuing its work with the Wisconsin DOT and the legislature to find real solutions to make Wisconsin's roadways safe for everyone.